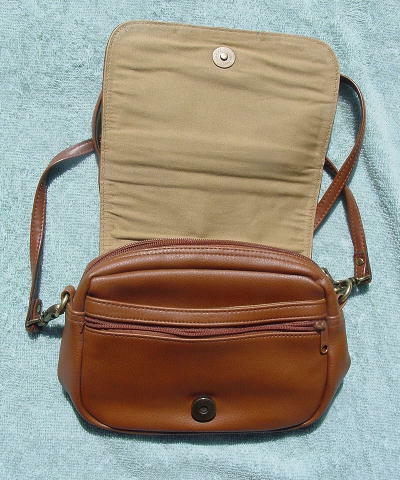 This dark caramel color purse has a detachable 47" long shoulder strap. The front has a full flap closure with a magnetic snap closure. The upper front flap has a hidden zippered compartment with a leather pull. 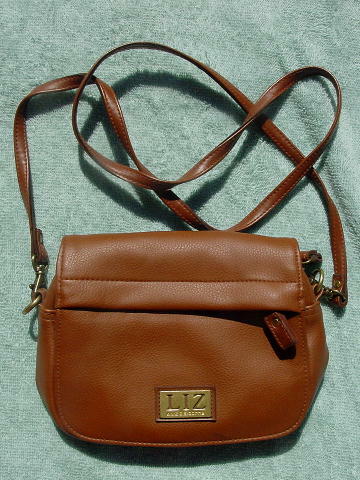 Near the bottom is a gold-tone metal mini plaque with an etched LIZ Liz Claiborne. All compartments and sections have a sandy-cocoa fabric lining. When you lift up the flap you find a 2/3 high zipper compartment, a 3/4 high open compartment, and a center section with a black logo tag.